According to Merriam-Webster, hype is defined as "to promote or publicize extravagantly". Now we all know that many fads and/or products are the result of hype, either by the origin itself and/or overly excited consumers. Whatever the case, hype creates a buzz where interested parties want a piece of the action. And that was the case with Ask for Luigi and our party of 6 (Whipping Girl, Darina, Joyce, Sean and Ned Flanders). All of use wanted to see for ourselves what the fuss was regarding this little pasta place located on the edges of Railtown and Gastown. We were able to secure a reservation, albeit an early 5:45pm. The place was packed throughout our meal and it was a Wednesday. Hype? 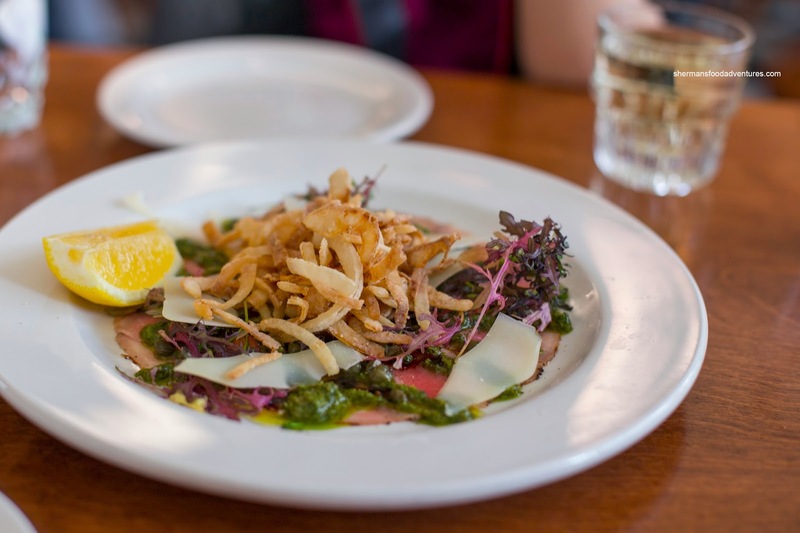 I guess we were about to find out... We began with the Beef Carpaccio with salsa verde, shaved Piave, capers, lemon and crispy onions. As much as the beef was melting in my mouth, there was probably a bit too much clutter on the plate which ultimately overwhelmed the main ingredient. With that being said, the individual ingredients were good as it provided a balance of acidity, aromatics, saltiness and texture. Next up was the Bocconcini Fritti which were fantastically prepared where the crispy golden breading encased a melting centre. With just the right amount of saltiness, this was simple yet tasty. Moving along, we had the Fried Cauliflower & Aioli which arrived as a massive portion. 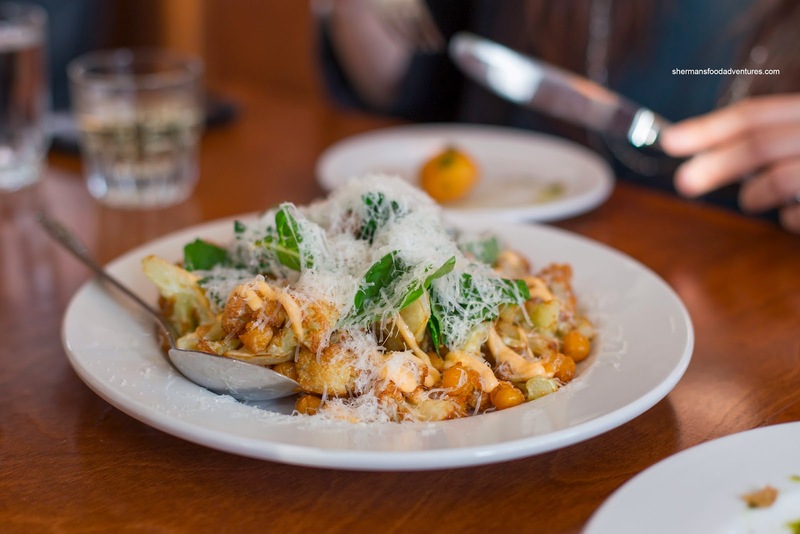 It was accompanied by fried chickpeas, fresh basil and Parmesan. Although quite greasy, the dish itself was not bad. 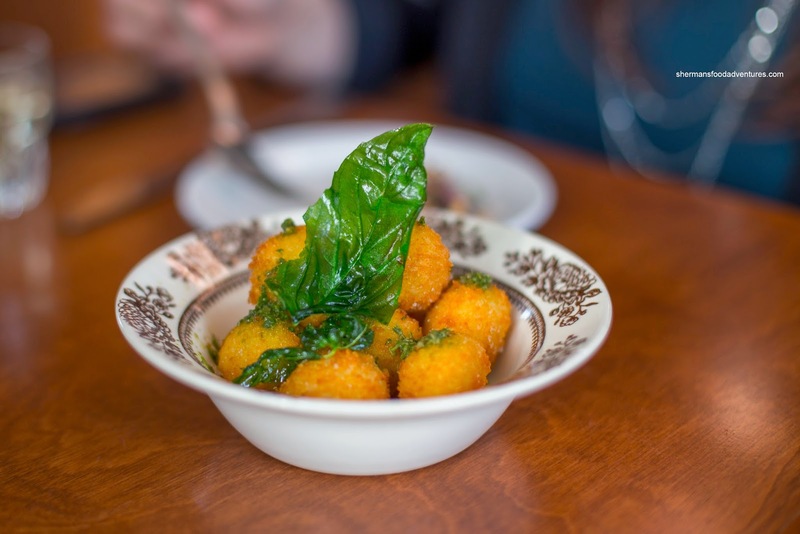 The slightly browned cauliflower maintained a level of firmness while being tender. It was not longing for flavour as the cauliflower alone was savoury without the benefit from the other ingredients. In my mind, the highlight was the chickpeas as they were soft on the inside while crisp on the outside. So that we were able to have one each, we got a double order of Luigi's Meatballs. These were large and really moist (thanks to the ample processing of the meat). The addition of pine nuts and sultanas afforded a certain woodsy sweet flavour. The fresh tomato sauce provided moisture, acidity and a lingering spiciness. 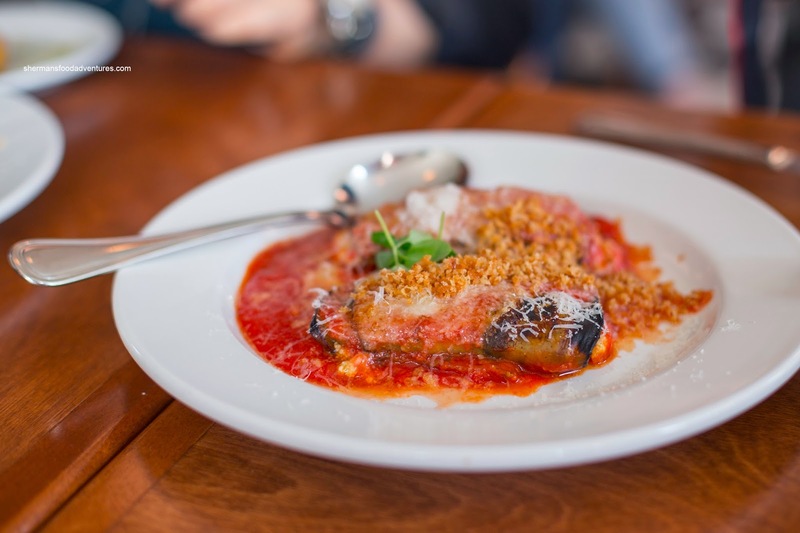 Our last appie was the Eggplant Involtini in the same low-rumbling spicy and tart tomato sauce as the meatballs. As much as the eggplant was really soft, it wasn't obliterated. I thought the addition of crunchy crumbs was a smart move as there was contrasting texture. The good amount of ricotta and Parmesan ensured there would be both creaminess and a salty cheesiness to the dish. Heading into the pasta dishes, I first sampled the Ricotta Ravioli with peas and marinated tomatoes. 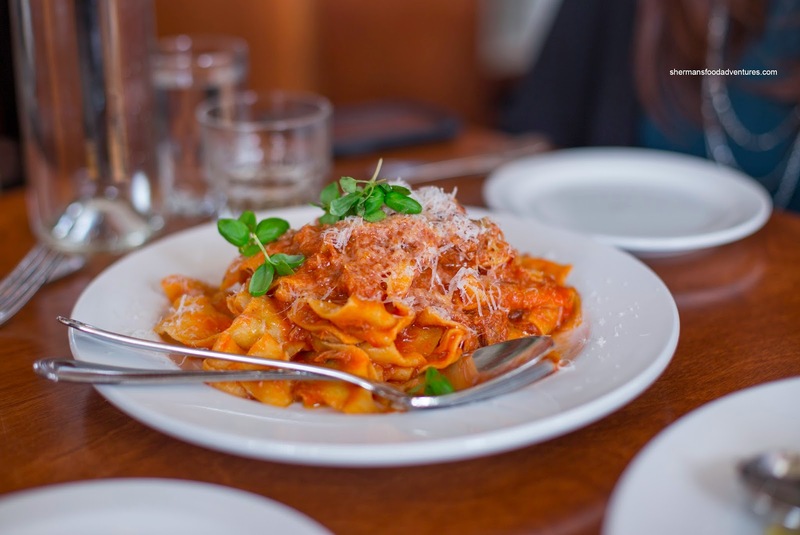 Naturally, with fresh pasta, it is generally more difficult to have it super al dente. With that being said, I found these to be rather soft and it was further exacerbated with the soft filling. The flavours were nice though with plenty of Parmesan accented by the tart and slightly sweet tomatoes. I wasn't a big fan of the peas as they were hard without the anticipated sweet pop. On the other hand, my prediction for impactful flavours was realized in the Spaghetti with anchovies, garlic and chilis. With a hit of fishy saltiness combined with an equally strong garlic presence, this pasta was definitely not mild considering the extra hit of saltiness from the cheese and spiciness from the chilis. 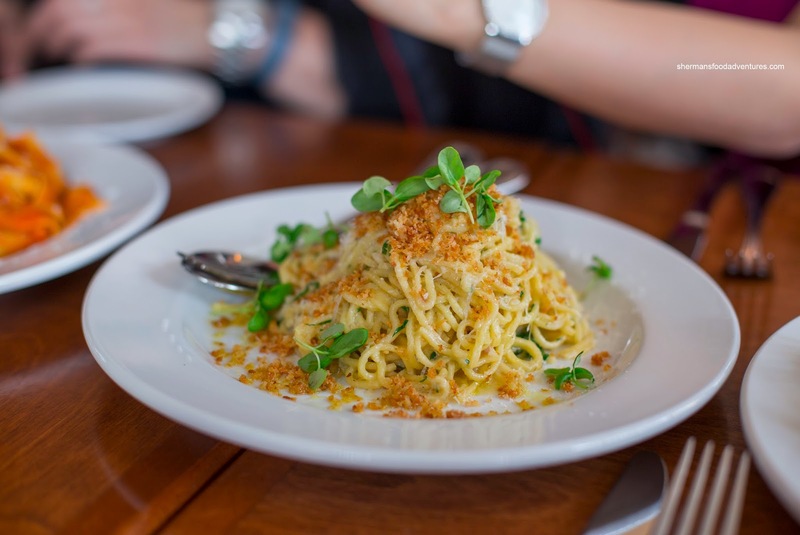 I liked the addition of crunchy crumbs as it provided a jolt of texture to the fairly firm noodles. From flavour impact to something more mild, I tried the Tagliatelle with fennel sausage and rapini. 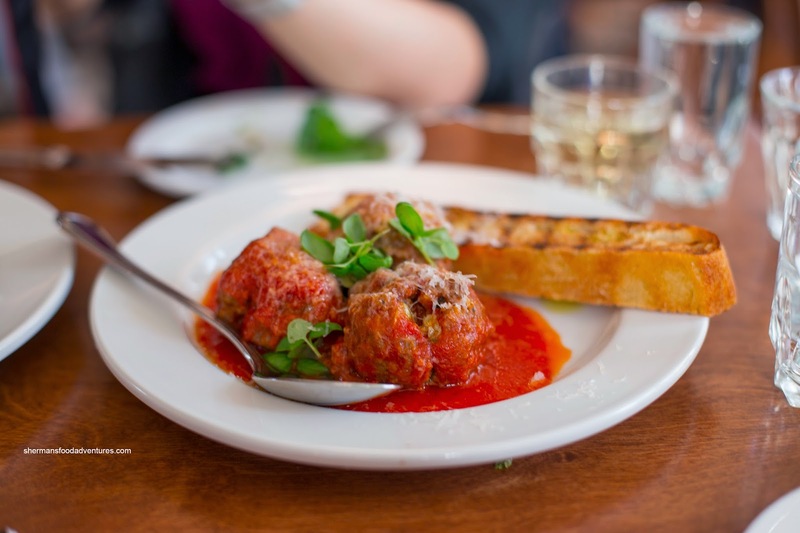 If I wasn't told that there was fennel sausage in the dish, I wouldn't have really noticed it. Rather, I could taste the spice, herbs and a hint of lemon. This could've used more sausage and/or more fennel in the sausage itself. Although it was toothsome, the pasta was a bit clumpy. 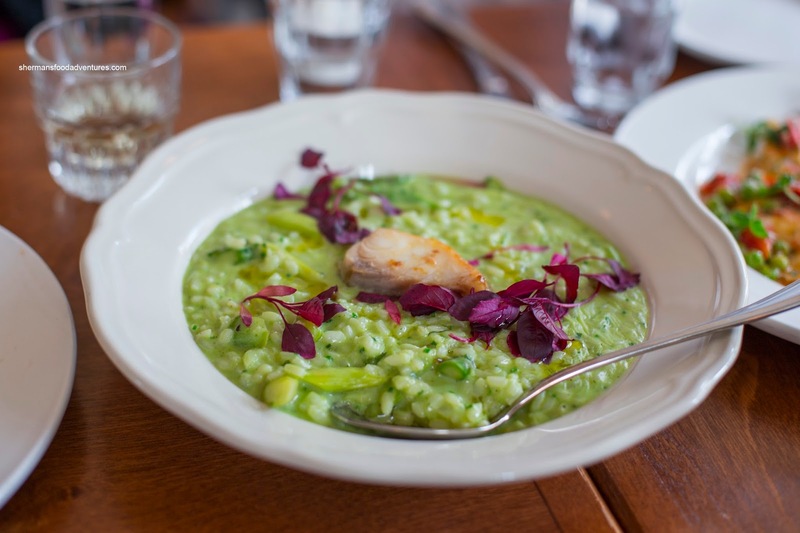 Arriving in a beautiful and lively shade of green, the Risotto with asparagus and smoked sablefish was pretty good. Although on the more "wet" side, it spread nicely on the place and was still chewy. I liked the creaminess as well as the buttery pieces of asparagus. I thought the risotto was well-seasoned with just the right amount of cheesiness. The small piece of sablefish was flaky and moist with only the slightest hint of smoke. 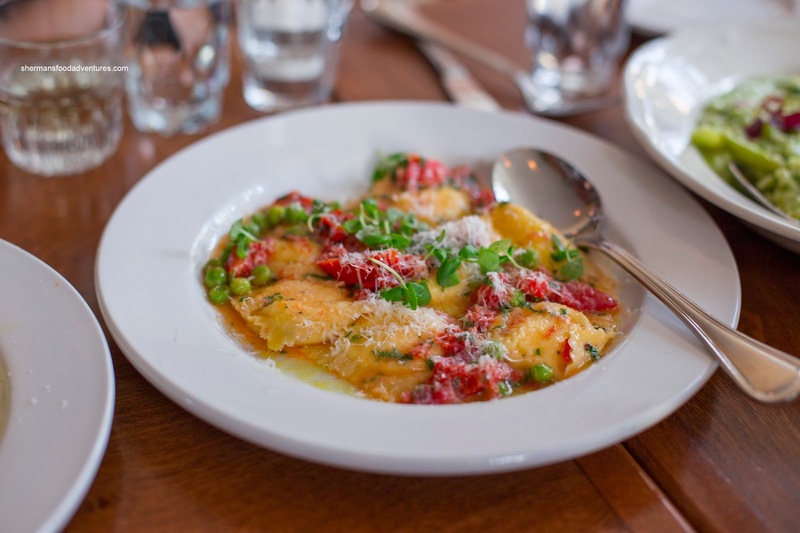 We surmised that the Pappardelle & Duck Ragu would be a potential crowd favourite, so we ordered 2. It turned out that we were right as it was blessed with a plethora of moist shredded duck. The sauce was mild at the start and ended with a spicy kick. The pasta itself was on the softer side, but okay nonetheless. 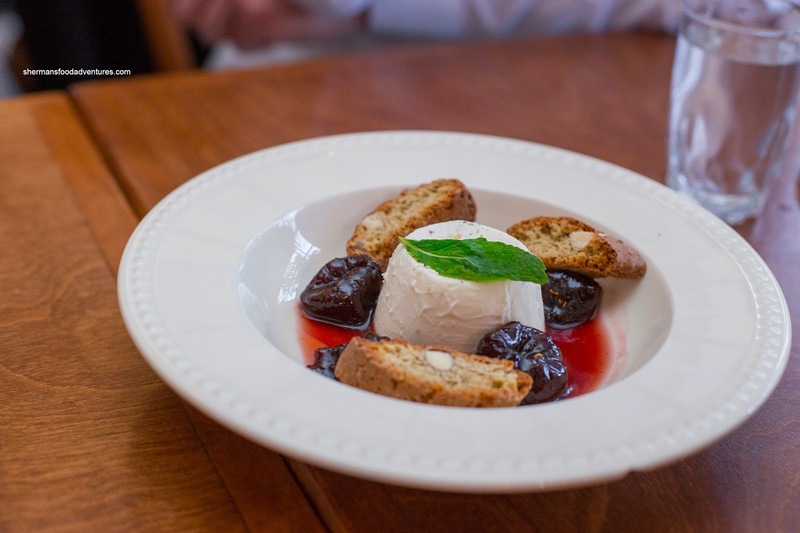 We decided to go for all 3 desserts to share starting with the Panna Cotta with prunes and biscotti. I gotta hand it to them because this was one excellent panna cotta. Super creamy, rich and amazingly light, it was not overly sweet where the vanilla served notice. The light sauce with prunes was not overwhelming while the biscotti was fresh. Next, the Chocolate Budino was really dense and rich. As much as it is supposed to be a pudding of sorts, it resembled a flourless chocolate cake in this case. For me, it could've been more impactful. 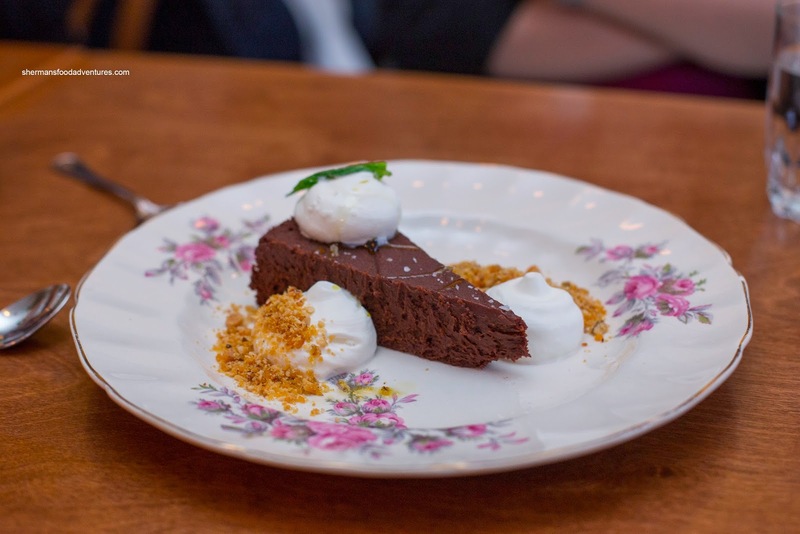 With some crunchy bites on the side, there was some texture to the dessert. 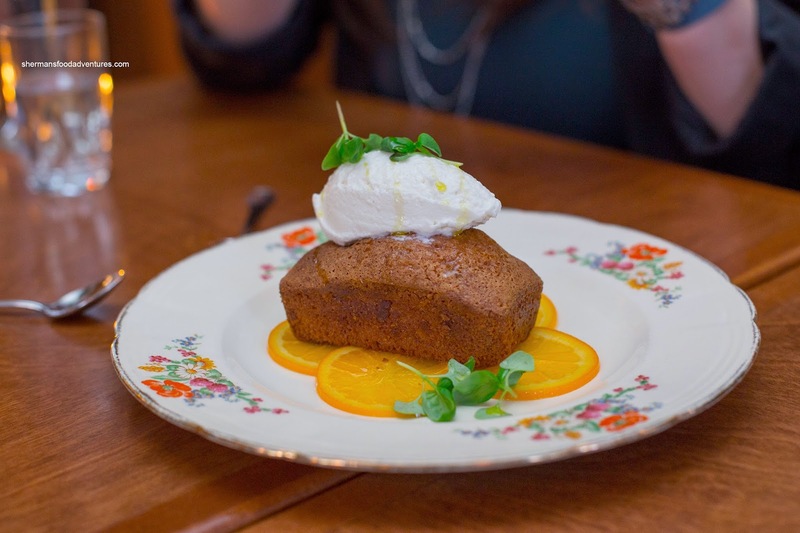 As for the Olive Oil Cake, it was almost anti-climactic after the first 2 desserts. It wasn't as if we didn't like it though. Rather, it was more about subtle flavours and a moist texture. That it achieved. Overall, we enjoyed our meal at Ask for Luigi. Did it live up to the hype? Partly. 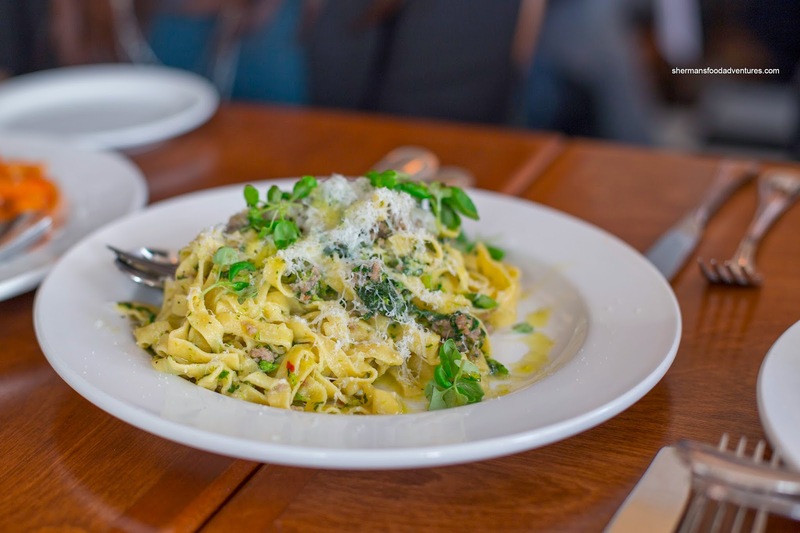 Was it the best pasta in the city? Well no. However, that doesn't mean it wasn't good either. 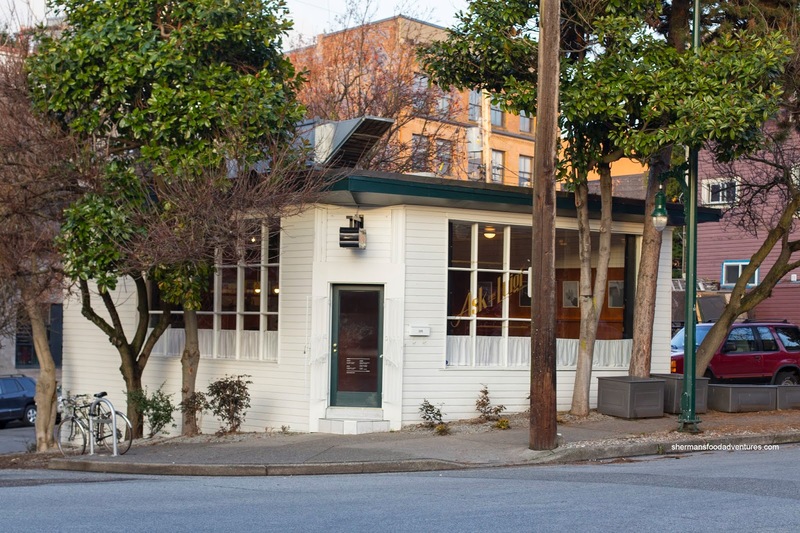 In actuality, Ask for Luigi ultimately achieves its goal of producing above-average eats for a reasonable price.